“The chief officer shot one man — I didn't see this, but three others did — and then he shot himself ." 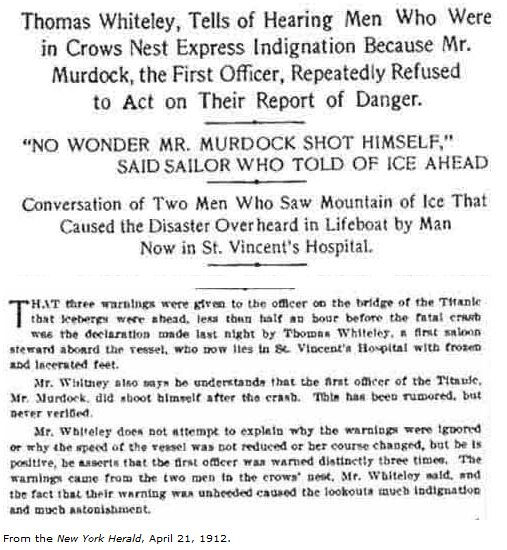 "The first officer of the Titanic, Mr Murdock, did shoot himself after the crash." Titanic & Her Sisters Olympic and Britannic lists a “Whiteley, Thomas” under the “Stewards” section in the passenger and crew lists (p.486 (3.)). As a waiter/steward, it is expected that he would have a good memory for details and have expertise in overhearing conversations. It is no wonder then that his account is based on hearing three others talk of seeing the incident. 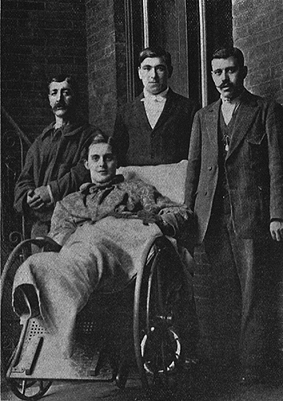 Thomas Whiteley at St Vincent's Hospital. Wormstedt alleges that the above account is “flawed” because although “all of the lookouts were saved, none were on Collapsible B or No. 4, and all left the ship long before the Boat Deck dipped under… Since the exact sources of Whiteley’s stories are unknown, his testimony must be taken with caution.” (Bill Wormstedt, Shots in the Dark (12.)) While it is correct that it does not seem logical that one of the lookouts would have observed Murdoch’s alleged suicide, it is possible that Whiteley got the identity of the individuals concerned wrong. Floating on an up-turned lifeboat in the middle of Atlantic in the early hours of the morning it is not expected that one could positively identify the sources of such comments. He seems to also have been the victim of misquotation and because of this we should not immediately discount his observations. Even then, his story remains fairly intact –that he overheard talk of an officer shooting a man and then himself. On the same day as the above article,The New York World ran a similarly worded article that goes on to also provide a further information:. "As we stood there on Collapsible B, each man holding on to his neighbours shoulder fearful every moment that some lurch would send us off again into that icy water, two of the men I knew had been on watch in the crow's nest that night spoke up. 'It's no wonder Mr. Murdoch shot himself,' said one to the other. I asked him why." The New York Herald, April 21, 1912. 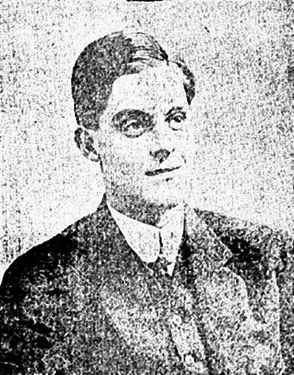 Thomas Whiteley Tells of Hearing Men Who Were in Crow's Nest Express Indignation Because Mr Murdock, the First Officer, Repeatedly Refused to Act on Their Report of Danger. Castillo, in New York after the disaster. 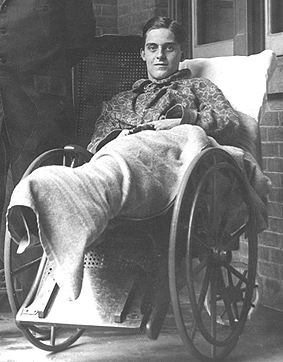 Regarding Whiteley's injuries Peter Thresh in his book Titanic writes in a caption to a photograph of Whiteley in a wheelchair with rugs wrapped around his legs: “Thomas Whitely, first saloon steward, whose leg was caught as lifeboats were being lowered.” (Peter Thresh, Titanic, p.71 (4.) ) Cross-referencing this with the information from Encyclopedia Titanica and Shots in the Dark quoted above, it is more likely that the injuries to his legs were caused from being in the water (junior wireless operator Harold Bride, who also sought refuge aboard collapsible B after a period of time in the ocean, had very similar injuries due to badly frozen legs). However it must be noted that all of the above reports came almost exclusively via a synidcated agency that interviewed him while he was recovering in St. Vincent’s Hospital. In other words, they are almost all third-hand accounts -relating what Whiteley himself had mostly only heard from someone else. Interestingly, Whiteley was never called upon to testify at either of the British or American investigations. Some may assume this because they thought his accounts were too sensational. 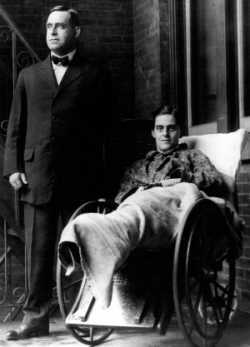 However, it seems this was more due to an oversight or due to his health condition than deliberate as Chairman Smith of Senate Inquiry was ready to consider the more sensational evidence of a Hungarian named Luis Klein, who alleged he was a surviving member of the crew and that "the officer of the watch was asleep on deck when the Titanic smashed into the iceberg's projecting spur, and that other officers and members of the crew were drunk or drinking. Wine, he said, was being passed out of the cabin" an account that was later discredited (New York Times, Monday 22 April 1912).In fact it does seem that they wanted Whiteley to testify but his health prevented it. According to the same newspaper account "The committee is particularly anxious to get Assistant Steward Thomas Whitely as soon as he can be moved from St. Vincent's Hospital, New York." (New York Times, Monday 22 April 1912). From May 1912 he began giving public lectures and was able to tell his full story, providing context to his claims. A full version can be read on the Encyclopedia Titanica website here. But in summary it is a reasonably balanced and informative account, detailing that he spent most of his time on the portside helping Lightoller and that he eventually found sanctuary on upturned collapsible B. He also describes seeing the ship break in two, something that was not verified until the discovery of the wreck in 1985. And on closer inspection most of his sensational claims hold water. For example, we now know that iceberg warnings did go unheeded and that there was a possible delay before Murdoch made his hard-a-starboard' decision (refer to the updates section). 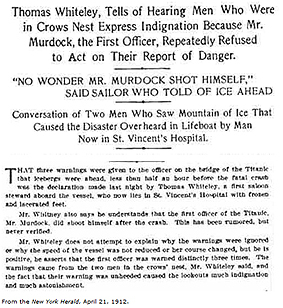 Not only was he given a chance to tell his story but in regard to his account of the lookouts warnings being disregarded he clearly was willing to put his money where his mouth was as in 1914 he filed a law suit against the White Star Line in which he claimed negligent steering and that Titanic had been unseaworthy (Chicago Daily Journal, Friday 16 January 1914) which seemingly was settled out of court as there is no further mention of it. There is no further mention of the case so it can only be assumed that it was settled out of court or did not proceed due to lack of funds or evidence. However, it is interesting to think what evidence of "alleged negligent steering" the "number of nautical witnesses" would have considered. According to Encyclpedia Titanica Whiteley, by 1930, he was living at 66 Melrose Avenue, Los Angeles, his occupation being Moving Picture Actor and later “Cast Director” in a film studio. He died as a Royal Air Force Warrant Officer on 11th October 1944, apparently as the result of cardiac problems, at the age of 50.((8.)). Whiteley is clearly not providing first-hand eyewitness evidence, but repeating what he had heard from three men while on the upturned collapsible B. Two of the men he heard this from he described as lookouts and that while he "carefully marked every word they uttered" admitted that "I don't recall the exact words of the men, but I am certain of the sentiment they expressed". He "did not know the name of either of the lookout men, and he said he believed they had gone back home on the Lapland." (New York Times, Sunday 21 April 1912). His other evidence does not raise any substantial doubt over his account of a suicide. In fact it suggests that there are three eye-witnesses we could add to the list.